Spider-Man: Into the Spider-Verse is a 2018 computer-animated superhero film from Sony Pictures. It was developed by the filmmaking duo of Phil Lord and Christopher Miller, the writer-directors of the animated films, Cloudy with a Chance of Meatballs (2009) and The Lego Movie (2014), and the live-action films, 21 Jump Street (2012) and the sequel, 22 Jump Street (2014). Spider-Man: Into the Spider-Verse introduces Miles Morales (Shameik Moore), a teenager who is a fan of Spider-Man. As the story begins, Miles is dealing with the fact that he must attend an elite boarding school, Brooklyn Visions Academy. Although he would prefer to remain in public school, Miles must accept the decision of his parents, his mother Rio Morales (Luna Lauren Velez), a nurse, and his father, Jefferson Davis (Bryan Tyree Hill), a police officer. Miles also has a shady uncle, his father's brother, Aaron Davis (Mahershala Ali), whom Miles visits for advice a curious girl he meets at his new school. Aaron encourages Miles' passion for graffiti and takes him to an abandoned subway station where he can paint and draw. It is there that a genetically-altered spider bites Miles, causing him to develop powers similar to his hero, Spider-Man. Miles meets his hero and learns that Spider-Man is trying to stop Wilson Fisk a.k.a. “The Kingpin” (Liev Schreiber) from using a device that will give him access to parallel universes. Now, Miles must join Spider-Man types from across the Spider-Verse to stop The Kingpin's activities from destroying all of reality. I could talk all day about how great Spider-Man: Into the Spider-Verse is, but I want to be more self-aware than The Kingpin is. I will focus on two stand-out elements in this film. First is Shameik Moore, who is great in his voice role, bringing to life a Miles Morales that is lovable and is as ground-breaking as he was in the comic books. Moore's performance personifies the dominate theme of this film, that the novice hero grows into the role of being a mature hero, which is especially true in the case of Spider-Man. Moore's performance also captures the one thing that has made Spider-Man popular worldwide, practically since he debut. Because of the kind of superhero costume Spider-Man wears, anyone can be behind the mask, including an Afro-Latino teen and even a teen girl. Moore and the filmmakers perfectly encapsulate the truth that Spider-Man is an every-man hero. The second thing about this film I want to highlight is its fantastic animation, eye-popping visuals, and breath-taking graphic design. The film combines the in-house computer animation of Sony Pictures Imageworks with traditional hand-drawn comic book techniques, much of it inspired by the work of Miles Morales's co-creator, artist Sara Pichelli (who created the character with writer Brian Michael Bendis) and artist Robbi Rodriguez, co-creator of Spider-Gwen/Spider-Woman. 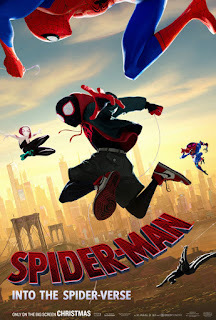 Spider-Man: Into the Spider-Verse blends 3D computer animation with the 2D sensibilities of comic book graphics, graffiti, collage, mixed media, and street art to create the visual look for the film that is thoroughly modern, but also reflects the visuals and graphics of 1960s Marvel Comics titles, especially the quintessential Spider-comic, The Amazing Spider-Man. Apparently, 2D artists took the renderings of 3D computer-animators and drew on top of those renderings various comic book drawing techniques, including line work, dots, and painting. The combination of 2D and 3D makes much of the film look like a series of comic book panels, so there are times that Spider-Man: Into the Spider-Verse is like a comic book-in-motion. It becomes a living, breathing comic book, pulsating with static-electric life. Isn't it obvious that I love me some Spider-Man: Into the Spider-Verse? It is the best Spider-Man film to date, and the second best comic book movie of the year, behind Black Panther. I hope that adult audiences that generally avoid animated films don't avoid Spider-Man: Into the Spider-Verse. It is much better than the vast majority of comic book and action films that they have seen over the last decade. Spider-Man: Into the Spider-Verse is a triumph, and it could be a game-changer.